The closest ever finish in the history of the Superbike World Championship came today at Magny-Cours when Max Biaggi (Aprilia Racing) ended the second race in fifth place and in doing so he ended up the season 0.5 points ahead of Tom Sykes (Kawasaki Racing Team). Biaggi had fallen in the first eni FIM Superbike World Championship race of the day, leaving open a path of opportunity for Sykes and race one second place finisher Marco Melandri (BMW Motorrad Motorsport). With Melandri crashing out in spectacular style in race two it was down to Sykes to make the running and he did it in style after putting in his fourth race win of the year. Biaggi, receiving pit signals from his crew, had worked his way far enough forward to take the overall win and score his second SBK championship, adding to his 2010 season win, again for Aprilia. Biaggi now has two world titles, 21 race wins, 70 podiums and five pole positions to his credit, and four 250GP titles to boot. Max Biaggi: “This is the fourth world championship out of six that I have won at the final race, I seem to like difficult challenges! The 2012 season went right down to the wire: we started well with a win at Phillip Island after totally renewing my team and we also had some difficult moments. We had to work hard to win the title, and maybe for this reason it’s even better. A big thanks to the Team, Aprilia and the Gruppo Piaggio, from President Colaninno to every factory worker, because my success is the result of the work of a great Italian company. Thanks also to my family, my fiancée and my two children, as well as Marino Laghi who is always present with me”. In the final championship rankings in 2012, Biaggi has 358 points, Sykes 357.5 and Melandri 328.5. Aprilia also won the Manufacturers’ Championship today, by 23.5 points from BMW. Race 1 – An amazing penultimate race, held in wet conditions, saw early contender Biaggi fall on lap two and his two remaining championship rivals, Melandri and Sykes score podiums for second and third respectively. Guintoli continued his amazing form in privateer guise with a clear win, by over six seconds from Melandri and by over 16 seconds from Sykes. This was Guintoli’s third win of the year. Results: 1. Guintoli (Ducati) 23 Laps/101.453 km in 44’06.299 average 138.016 kph; 2. Melandri (BMW) 6.127; 3. Sykes (Kawasaki) 16.595; 4. Berger (Ducati) 21.857; 5. Haslam (BMW) 25.149; 6. Badovini (BMW) 32.778; 7. Laverty (Aprilia) 34.311; 8. Giugliano (Ducati) 47.269; 9. Corti (Kawasaki) 49.720; 10. Baz (Kawasaki) 50.192; etc. Race 2 – Sykes did all he could in winning race two, impressively by 1.354 seconds despite pressure from behind for the whole race distance on a largely dry track. Jonathan Rea (Honda World Superbike Team) was second in the 23-lap race, with Guintoli third. Biaggi’s team-mate, Laverty was fourth in the race, but Melandri crashed out of contention. Maxime Berger made it a happy day for the French with fourth on his Red Devils Roma Ducati. Results: 1. Sykes (Kawasaki) 23 giri/101.453 km in 38’15.725 media 159.092 km/h; 2. Rea (Honda) 1.354; 3. Guintoli (Ducati) 2.393; 4. Laverty (Aprilia) 13.122; 5. Biaggi (Aprilia) 13.955; 6. Giugliano (Ducati) 18.229; 7. Checa (Ducati) 18.430; 8. Davies (Aprilia) 26.648; 9. Badovini (BMW) 33.809; 10. Camier (Suzuki) 37.217; etc. Points: 1. Biaggi 358; 2. Sykes 357,5; 3. Melandri 328,5; 4. Checa 287,5; 5. Rea 278,5; 6. Laverty 263,5; 7. Guintoli 213,5; 8. Haslam 200; 9. Davies 164,5; 10. Giugliano 143; etc. Manufacturers: 1. Aprilia 444,5; 2. BMW 421; 3. Ducati 416; 4. Kawasaki 397,5; 5. Honda 293,5; 6. Suzuki 136.5. Jules Cluzel (PTR Honda) took his fourth win of the year today at Magny-Cours as he made the best of a wet track and then a drying line around the 4.411km circuit. The French rider underlined his second place in the championship with Sam Lowes (Bogdanka PTR Honda) third overall in the points after finishing second today. Third place at Magny-Cours eventually went to Dan Linfoot (MSD R-N Team India Kawasaki) after he was knocked off by an attempted pass from new champion Kenan Sofuoglu (Kawasaki Lorenzini). Linfoot restarted to finish fourth but Sofuoglu was penalised 25 seconds and thus Linfoot was eventually third and Sofuoglu fourth. In the final championship table, Sofuoglu has 231 points, Cluzel 210, Lowes 172 and Fabien Foret (Kawasaki Intermoto Step) 171. Honda won the manufacturers’ Championship by 14 points from Kawasaki. Results: 1. Cluzel (Honda) 22 Laps/97.042 km in 42’20.985 average 137.487 kph; 2. Lowes (Honda) 1.591; 3. Linfoot (Kawasaki) 27.615; 4. Sofuoglu (Kawasaki) 27.854; 5. Foret (Kawasaki) 31.601; 6. Baldolini (Triumph) 46.745; 7. Scholtz (Honda) 50.820; 8. Antonelli (Yamaha) 50.934; 9. Talmacsi (Honda) 53.090; 10. Metcher (Yamaha) 55.664; etc. Points: 1. Sofuoglu 231; 2. Cluzel 210; 3. Lowes 172; 4. Foret 171; 5. Parkes 135; 6. Morais 96; 7. Baldolini 96; 8. Quarmby 84; 9. Iannuzzo 60; 10. Antonelli 60; etc. Manufacturers: 1. Honda 287; 2. Kawasaki 273; 3. Triumph 125; 4. Yamaha 110; 5. Suzuki 6. Sylvain Barrier (BMW Motorrad Italia GoldBet) survived a wet track and the pressure of racing for the championship at his home round to finish second at Magny-Cours and give himself an eventual clear championship win. His French countryman Jeremy Guarnoni (MRS Kawasaki) rode with confidence and pace in the wet to win the race, but main championship challenger Eddi La Marra (Barni Racing Team Italia Ducati) fell very early and lost his chance to get back into the race. Another potential champion Bryan Staring (Team Pedercini Kawasaki) fell early and rode hard to try and get back into contention. He finished fifth in the race and eventually fourth in the championship. The final points read Barrier 153, La Marra 130, Guarnoni 123, Staring 122. Results: 1. Guarnoni (Kawasaki) 14 Laps/61.754 km in 28’12.230 average 131.374 kph; 2. Barrier (BMW) 9.862; 3. Savadori (Ducati) 20.703; 4. Lussiana (Kawasaki) 34.445; 5. Staring (Kawasaki) 37.916; 6. Bergman (Kawasaki) 39.886; 7. Jezek (Ducati) 43.775; 8. Millet (Kawasaki) 49.227; 9. Pagaud (Kawasaki) 49.678; 10. Reiterberger (BMW) 1’03.515; etc. Points: 1. Barrier 153; 2. La Marra 130; 3. Guarnoni 123; 4. Staring 122; 5. Savadori 107; 6. Reiterberger 91; 7. Bergman 88; 8. Massei 71; 9. Coghlan 68; 10. Baroni 56; Manufacturers: 1. Kawasaki 193; 2. Ducati 181; 3. BMW 181; 4. Honda 71; 5. Aprilia 22. The final race of the year went to local rider Guillaume Raymond (Valliance Racing) but the championship win was still taken by Lukas Wimmer (MSC Schalchen), who crashed out and then remounted to finish third. Ilya Mikhalchik (Wind Racing) was second in the race, Gaston Garcia (KTM Espana) fourth. Wimmer took the title with 136 points to 111 for Garcia. Results: 1. Raymond; 2. Mikhalchik; 3. Wimmer; 4. Garcia; 5. Demoulin; 6. Haquin; 7. Mettam; 8. Scarcella; etc. Points: 1. Wimmer 136; 2. Garcia 111; 3. Orellana 81; 4. Vidal 73; 5. Wielebski 72; 6. Pasek 65; 7. Patterson 59; 8. Demoulin 59; etc. Finishing third and first in the Magny-Cours races Tom Sykes (Kawasaki Racing Team) only lost the world championship by half a point, in the closest finish the series has seen in all its 25 years. Super Sykes Only Half A Point From The Title On His Ninja ZX-10R! Sykes and his team had to overcome the wet conditions that suddenly showed up on raceday morning with little time for preparations by his crew, but despite this Tom rode his Ninja ZX-10R with style in race one, only giving best to rain specialist Sylvain Guintoli and Marco Melandri. Eventual champion Biaggi fell and no-scored in race one and gave Sykes an opportunity to win the title in race two. Tom led with conviction and pace for the whole of race two, seeing off an early challenge from Eugene Laverty to record his fourth race victory of the season. Biaggi was fifth in race two and that was enough for the Italian rider to win his second world championship by only half a point. Sykes, wearing a Joan Lascorz tribute helmet this weekend in honour of his injured team-mate, won the hearts of the crowd with his brilliant determination and spirit to be champion against the odds, having made up 30 points on Biaggi and only losing the chance of overall victory by half a point because of a quirk of the championship scoring rules. Tom had known after winter testing that he would have the chance to challenge in 2012, but his and the entire team’s performance had exceeded all expectations. He has taken four wins, 13 podiums in total, nine pole positions and three fastest laps. Loris Baz, Sykes’ team-mate had a tough home weekend, going tenth in race one then falling hard at high speed in race two. He was taken to hospital for tests afterwards but was later released, suffering just extensive bashes and bruises. He finishes his season as a replacement for the injured Joan Lascorz in 13th place, having only joined the series in Donington. Team Pedercini Kawasaki rider Claudio Corti was ninth in race one, and then 12th in race two, strong results that put him 24th overall after only one round. His Magny-Cours team-mate Alexander Lundh had a heavy crash in practice and injured his T7 and T8 vertebra, although not seriously. He missed the Magny-Cours races as a result. The title deciding Superstock 1000 FIM Cup race was held in wet conditions on Sunday morning and the race was won by Jeremy Guarnoni (MRS Kawasaki). Bryan Staring (Team Pedercini Kawasaki) lost his outside chance of the world title when series leader Sylvain Barrier finished second and took enough points to win the crown. Staring was fifth in the race after falling early on and working his way back up, and fourth in the championship, one place behind Guarnoni. Leandro Mercado fell and no-scored today. Kenan Sofuoglu (Kawasaki Lorenzini) finished third across the line today but he was relegated to fourth, leaving Dan Linfoot (MSD R-N Racing Team India) in third place for his first Kawasaki podium. With Sofuoglu fourth after a 25 second time penalty Fabien Foret (Kawasaki Intermoto Step) was a top five race finisher and he also finished fourth in the championship overall. Florian Marino (MSD R-N Racing Team India Kawasaki) was 11th today at his home race. Sheridan Morais (Kawasaki Lorenzini) had a difficult race after he could not get the correct settings for the conditions dialled in during morning warm-up and alternate settings did not work so well for most of the 22-ap race. Romain Lanusse was 28th. At the season finale of the 2012 FIM Superbike World Championship, Team BMW Motorrad Motorsport experienced an exciting race day, which at the same time was an emotional rollercoaster ride. The team challenged until the very last race of the season for both the Riders’ and the Manufacturers’ titles but was missing the necessary luck in the end. Factory rider Marco Melandri (ITA), who rode with two broken ribs, finished second in the first race. Therefore he kept his title chances alive as well as BMW’s chances of winning the Manufacters’ crown. But in the second race, a wet patch on the track, which made Marco lose control of his BMW S 1000 RR, ended all hopes. Leon Haslam (GBR), who at Magny-Cours (FRA) was competing in his last round as a BMW Motorrad factory rider, finished fifth in the first race but also crashed in the second heat. In the Manufacturers’ championship, BMW claimed its best ever result by finishing second with 421 points, 23.5 points behind winner Aprilia. In the Riders’ classification Marco finished the season in third with 328.5 points, so becoming the highest placed ever BMW rider in this championship. Leon is eighth with 200 points. 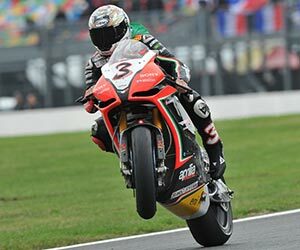 Max Biaggi (ITA) claimed the title 0.5 points adrift of Tom Sykes (GBR) and 29 points adrift of Marco. BMW Motorrad congratulates Biaggi and Aprilia. It was raining throughout the night and the morning. Even though the rain stopped before the first race, the track was still wet and the conditions tricky. Both Marco and Leon, who were fourth and seventh respectively on the grid, started steadily into the first heat, so not to risk too much in the treacherous conditions. Marco slipped back a few positions but made his way up towards the front by overtaking competitors and benefitting from several riders’ crashes. Halfway through the race, Marco was already third, on lap 13 he improved to second. He then fought an exciting battle with Sykes and Sylvain Guintoli (FRA) for the top position. The French local hero took the lead in front of Marco and was able to build a gap during the remaining laps. Marco comfortably secured second. Leon lost a few positions when he rode off track for a short time on lap four, but regained the places afterwards and crossed the line in fifth. For the second race the track had mostly dried out, but was still damp in places. Leon had a good start and improved to fourth immediately and was fighting for the podium positions on the following laps. Marco slipped back to sixth but kept up with the front runners, and was preparing to work his way back to the top. But on lap seven he lost control over his rear wheel and crashed. Shortly afterwards Leon rode off the track and rejoined in eighth, losing four positions. On lap 17 his race also was ended by a crash. The second heat was won by Sykes. Ayrton Badovini (ITA) of the BMW Motorrad Italia GoldBet SBK Team finished the races in sixth and ninth, his team-mate Michel Fabrizio (ITA) was 12th in the first heat but crashed in the second one. BMW Motorrad Motorsports congratulates Sylvain Barrier from the BMW Motorrad Italia GoldBet STK Team to his best ever success. The French BMW S 1000 RR rider was crowned 2012 champion of the FIM Superstock 1000 Cup by finishing today’s race second on the podium. “It felt good to finish a race on the podium again after the last two unfortunate race weekends. My BMW S 1000 RR was working very well. In the first couple of laps of race one I was still struggling a bit with warming up the tyre, but once the tyre was working I could go at quite a good pace. Anyhow, it was a tough race and I did not want to overpace and risk too much. Unfortunately the track dried up more and more, which did not play into my hands. When I finally passed Tom the track was not really wet anymore, and in these conditions I had no chance to follow Sylvain who really showed a strong performance today. Sylvain Barrier: FIM Superstock 1000 Champion on the BMW S 1000 RR. 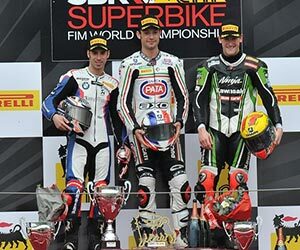 Another title win for the BMW S 1000 RR: French rider Sylvain Barrier was crowned champion at the season finale of the 2012 FIM Superstock 1000 Cup at Magny-Cours (FRA). For his BMW Motorrad Italia GoldBet STK Team it was the second title win in three years competing in the series, after the triumphant season with Ayrton Badovini (ITA) back in 2010. In the season’s ten races, 23-year old Sylvain celebrated four victories, which was more than any other rider. In total, the Frenchman rode his RR to six podium finishes and claimed seven pole positions. Over the course of the year, he also showed his spirit to never give up. He fought his way back to the top after a setback halfway through the season when he suffered a severe shoulder injury that put him a long way back in his title campaign. At the penultimate round two weeks ago at Portimão (POR), Sylvain retook the lead by finishing the race in second. He arrived with an advantage of three points to his closest rival at the season finale on home soil. At the last race of the year he secured the title by claiming another podium and finishing second. The first to congratulate him straight after the finish line was his mentor, double Superbike world champion James Toseland (GBR). FIXI Crescent Suzuki racer Leon Camier picked himself up from a huge crash in the first race of today’s eni FIM Superbike World Championship race at Magny-Cours in France to record a brave 10th place in race two. Camier had made his way up to sixth place by the end of lap nine in race one, despite the treacherous conditions caused by heavy rain around the 4,411m French circuit. He then suffered a huge crash which resulted in him being catapulted off his Yoshimura-powered GSX-R and into the gravel. The Englishman was pinned under his machine and could only get to his feet once the marshals had removed his bike, made his own way back to the pits, but was obviously in a lot of pain. Camier was passed fit for the second 23-lap race and lined up in the drier conditions in ninth on the grid. He made a poor start as he tried to adapt to the battering his body had suffered – mostly down his left-hand side – and because of a problem with the electronics, probably due to the crash in the first race, which made the bike very hard to ride. By the end of the second lap he was down in 17th, but Camier re-grouped and began to pick off riders in-front of him throughout the race. He made his way up to 10th by the start of the penultimate lap and held the position to the end of the race, despite being in considerable discomfort. John Hopkins wasn’t on the grid today after withdrawing from the weekend’s proceedings yesterday following a re-occurrence of his hip injury. He made the announcement today that he will be taking the 2013 season off to get himself back to full fitness and then re-assess his options once he is back to strength. Today’s first race victory was taken by Sylvain Guintoli on a Ducati on his home soil, with Tom Sykes racing to victory in the second event to push the title battle right to the wire. Italian Max Biaggi crossed the line in fifth place in race two, which was enough to give him the championship crown by the smallest margin in Superbike history. 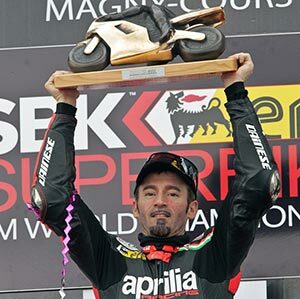 Biaggi took his second WSBK title – the sixth World Championship in his career – by just 0.5 points from Sykes. FIXI Crescent Suzuki will have a test at Aragon later this month and will also make the announcement of Camier’s team-mate for next year very soon. The provisional date for the first round of 2013 is Sunday February 24th at the Phillip Island Circuit in Australia. Leon Camier: “I am really happy with our performance in wet conditions, but race one was neither wet, nor dry and that is the worst possible scenario. All was going OK until I came out of turn 11 and was high-sided. I was flipped into the air and came down heavily on my left arm and head and then the bike landed on top of me and I couldn’t move. It seemed ages before it was removed and I was able to get up. I felt pretty sore, but luckily I hadn’t broken anything, even though my left arm had taken a right old battering. FIXI Crescent Suzuki racer John Hopkins will be taking a sabbatical from professional motorcycle racing for 2013 as he prioritises a return to full fitness before considering the next steps in his career. Hopkins has been struggling with injuries for the whole 2012 season and was forced to withdraw early from this weekend’s World Superbike event in France due to a re-occurrence of his hip injury. He initially had to have a finger-top amputated in January, due to the after-effects of an injury from 2011, and then crashed heavily in a pre-season test in Australia and broke the same hand. He had to undergo six surgeries, including failed corrective surgeries, suffered a severe infection and eventual amputation of the finger in a span of four months. Then the same hand was badly broken only six weeks after the amputation, which resulted in the 29th surgery of his career – at only 29-years-old! Hopkins made a return to the Suzuki GSX-R at the Imola round, but then crashed heavily two events later in Monza, a massive high-side that resulted in him severely injuring his hip. Hopkins again returned to competitive action after a one-race lay-off, but has battled against the damage to his hip for the remainder of the season. He has shown glimpses of the talent that led him to fourth place in the MotoGP World championship in 2007 and to the fantastic performances in BSB in 2011, but has been unable to produce the form he knows he needs to be as competitive on the world stage. Hopkins will return home to America to have further tests and repair evaluations on his injured hip and will then decide what his next course of action will be. John Hopkins: “I have really struggled with my hip since the crash at Monza and I know that it is a priority to get my health sorted before I can even think about racing again. I didn’t want to pledge myself to the FIXI Crescent Suzuki team for 2013 and then not be able to give 100% because the injury is a constant worry, so although this is a difficult decision it is the correct one. I will be going back to America for a bunch of tests and then we’ll decide what the best course of action is. If that is a hip replacement or something similar, then that is what I am prepared to do to make sure I can get my health and fitness back. At the moment the injury is influencing everything I do in my home, personal and racing life, so I need to get it sorted out properly. I still have the desire and passion to race against the world’s best riders but every time I have pumped myself up to go for it this season, the hip has quickly and painfully reminded me that I need to be careful – and that’s no way to go racing. Paul Denning – Team Principal: “We all saw what a formidable competitor John Hopkins is throughout 2011 – in BSB, the Silverstone WSBK wildcard race and on the Suzuki MotoGP machine. He’s not a prolific crasher by any means – nearly every rider on the grid crashed in the Philip Island tests! – but John has just suffered ridiculous bad luck and has managed to create new injuries or severely aggravate old ones every time there has been an incident. It’s an indication of his talent that John has been somewhere close to the best riders on lap times in WSBK even with the restrictions he’s had to cope with. The FIM Superbike World Championship has now delivered Jonathan Rea (Honda World Superbike Team) 29 career podiums in 98 individual career races after he finished second in race two today, making up for the disappointment of crashing out of race one while leading, and then limping home to finish 13th. Rea completed his latest SBK season in overall fifth place, with two race wins to his credit. He was only nine points from a top four finish in the points table. The 25-year-old rider from Northern Ireland, who has combined MotoGP duties with his full-time SBK commitments, recently was going through his fifth consecutive race weekend at the SBK season finale. He fell in the first 23-lap race at the 4.411Km Magny-Cours circuit in wet and very slippery conditions that saw many top riders fall or run wide. He was lapping two seconds faster than his closest rivals for some time, but fell on lap 13 when his rear snapped out while he was almost upright. He was lucky to walk away with just bashes and bruises and was all ready to start race two. 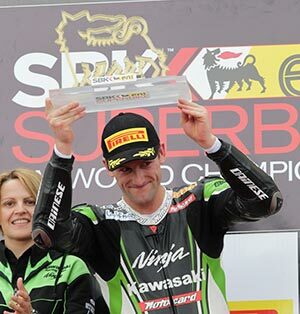 He was glad he did when he ran eventual race two winner Tom Sykes (Kawasaki) a close second. Sylvain Guintoli had won race one, in wet conditions on his privateer Ducati. In the championship Max Biaggi (Aprilia) won his second SBK title by finishing fifth in race two, winning the crown by an impossibly small margin of 0.5 points over Sykes. This was the closest ever finish in SBK’s 25 year history. Hiroshi Aoyama (Honda World Superbike Team) qualified 18th at Magny-Cours and completed his rookie season in the same 18th place overall. He was a retiree in the first wet race today, but 14th and in the points in race two, in largely dry conditions. Jules Cluzel (PTR Honda) made the break at the front of the field in the FIM Supersport World Championship race at Magny-Cours that proved eventually decisive, finally winning his home race by1.591 seconds from a chasing Sam Lowes (Bogdanka PTR Honda). Cluzel finishes the season second overall and Lowes is back up to third. The combined efforts of many Honda riders gave the Manufacturers’ Title to Honda, for the ninth time. After two dry days of practice a wet warm-up was the only chance the WSS riders had to put good settings in their machines. Some succeeded and some did not, with fortunes changing for many riders on the final raceday of the 13-round 2012 season. New champion Kenan Sofuoglu (Kawasaki) was third over the line in today’s race, but was finally penalised back the fourth after colliding with eventual podium finisher Dan Linfoot (Kawasaki) and knocking him off. Held in damp yet slowly drying conditions the 22-lap race was a tricky one for all and particularly for Broc Parkes (Ten Kate Racing Products Honda) who raced with a rear tyre that had too much pressure in it. Despite starting from pole he dropped back to pit and then get going again and finished 27th. Parkes is fifth in the final points table. South African riders Ronan Quarmby (PTR Honda) and Mathew Scholtz (Bogdanka PTR Honda) had very different fortunes today, with Sholtz having his personal best race of the year in seventh after qualifying 16th, but Quarmby was fighting rear grip issues to go 26th. In the championship Quarmby finished eighth, Scholtz a much-improved 16th. Roberto Tamburini (Team Lorini Honda) was 25th in the tricky conditions,p but overall he was 12th in the final rankings, the fifth Honda overall. Gabor Talmacsi (PRORACE Honda) returned to form and was ninth, placing him 13th overall despite only competing in a few races this year. He had been an impressive sixth in qualifying. Imre Toth (Racing Team Toth Honda) was one place behind his team-mate Balazs Nemeth (Racing Team Toth Honda) in France, with Nemeth 12th and Toth 13th. They were the last Honda riders in the points today. Martin Jessopp (Riders PTR Honda) finished his season 18th in the order in France and 40th overall in points. Danilo Marrancone (Kuja Racing Honda) had a DNF at Magny-Cours. Miguel Praia (Ten Kate Racing Products Honda) went 22nd today and Valentin Debise (SMS Racing Honda) retired. A bittersweet ending to the 2012 SBK championship for Althea Racing and its riders Carlos Checa and Davide Giugliano at the French circuit of Nevers Magny-Cours today. Despite high expectations and the desire to send the Ducati 1198 into retirement in the best possible way, the races were far from easy; Checa crashed out in the first race, while Giugliano finished eighth, while in race 2 the Althea pair crossed the line together, Davide in sixth, Carlos seventh. Race 1 – Carlos made a fast start and was in third position at the end of the first lap, behind Rea and Sykes. Giugliano lost a couple of positions at the start and was down in 17th place but immediately fought back, passing a couple of riders with the passing of each lap to place himself tenth by lap three. Unfortunately the wet conditions conditioned Carlos’ race and a crash on lap seven put a premature end to his fight; he was unable to return to the track. Davide’s impressive pace allowed him to pass several more riders and he was in fifth place by lap eight. A couple of small errors meant that he lost valuable time, and positions, but he continued to battle hard all the way to the line, closing race 1 in final eighth position. Race 2 – at the end of the first lap Davide was lying eighth, followed by Carlos in ninth. Lap five saw Giugliano record the fastest lap of the race (1m39.237), which gave him the Pirelli fast lap award for the first time. Both Ducati riders were lapping with a strong pace during the first half of the race, and were up in fifth (Carlos) and sixth (Davide) position by lap ten. In the final phase the gap between the leaders and the chasing group, composed of Biaggi, Checa and Giugliano, increased. Despite the best efforts of both riders they were unable to reach the rivals immediately ahead of them and crossed the finish line in final sixth (Davide) and seventh (Carlos) position. The 2012 final championship standings see Checa in overall fourth place with 287.5 points. Giugliano, having gained some useful points today, moves up to final tenth position, with 143 points. Ducati closes the manufacturer’s championship in third place with 416 points, behind BMW (421) and Aprilia (444.5). The Ducati 1198 raced for the last time today and after five years of competition in the SBK series will now go into retirement, to be replaced by the new 1199 Panigale that will make its debut in the 2013 Superbike championship.